FOR HASSLE FREE ORDERING, GREAT PRICING, AND QUICK DELIVERY ACROSS CANADA, PLEASE CALL US FIRST! We are your leading supplier of soft, gentle, absorbent lint-free, static-free wipers - KimWipes, KayDry, Wypall, WEBRIL Wipes & HandiPads, PHOTEX wipes -for laboratories, eye clinics, dental labs, doctor's offices, press rooms, scanners, computer rooms, and other specialized equipment serving the Canadian market & US market for the last 20 years. 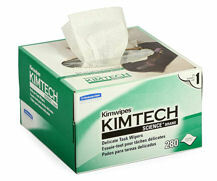 Kimwipes EX-L Delicate Task Wipers The industry standard for delicate task wiping. Silicone-free, 100% virgin cellulose construction and state of the art packaging deliver high absorbency, softness, and low-lint performance. Antistatic lint shield helps eliminate electrostatic discharge. KayDry Delicate Task Wipers Low-lint, soft and nonabrasive won't scratch delicate surfaces. Antistatic dispensing reduces lint and electrostatic discharge. Precision Wipers Economy brand, low lint, laboratory tissue wipers. Wypall L30 Economizer Low lint, highly absorbent, and disposable. Has a cloth like softness for cleaning and polishing acrylic without scratching. 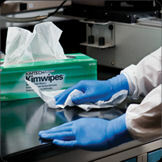 Kimwipes is the #1 Lab Wiper. The industry standard for delicate task wiping. Silicone-free, 100% virgin cellulose construction and state of the art packaging deliver high absorbency, softness, and low-lint performance. Antistatic lint shield helps eliminate electrostatic discharge.Low-lint softness safely cleans lenses, glass surfaces, electronics and lab equipment with no residue. Great for use on delicate spectroscopy quartz and glass cells. Also great for coated and sensitive optics. These wipes have always been a standard in laboratories. Low-lint, soft and nonabrasive won't scratch delicate surfaces. Antistatic dispensing reduces lint and electrostatic discharge. KayDry offer multi-ply absorbency that wipes clean liquid and dust. Easy dispensing with pop-up box. Wypall L30 EconoMizer Wipes have a high surface softness and cloth like feel that is ideal for cleaning plexiglass because it will not scratch. It's reinforced grid provides strength for wet surface wiping and cleaning. Good for light duty cleanups, janitorial & maintenance wiping, and process line wiping and cleaning. Wypall Shop Towels help eliminate the risk of rental shop towel borne contaminants by delivering a clean and consistent wipes every time. WEBRIL® nonwoven material is a unique, high quality fabric. 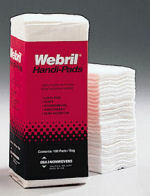 WEBRIL products will not scratch the most delicate coatings or surfaces.The interlocked fibers won't come apart, even when soaked in water or solvents.It is this process which insures the soft, pure and highly absorbent qualities WEBRIL Handi-Pads have all the properties WEBRIL material is known for in a 4" x 4" size convenient for many small press and plate making operations.WEBRIL Wipes are larger 8"x 8" wipes that are right for bigger jobs.Wipes come on a perforated roll. which makes these popular wipes convenient for use in a wall dispenser without taking up scarce shelf or table space. 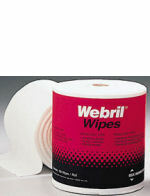 Webril Litho Pads are 4" x 8" pads on a perforated roll that are a smaller alternative to Webril Wipes. Convenient dispenser box allows for dust resitant storage. 4 x 8 pads on a perforated roll provide a smaller alternative to Webril Wipes. Convenient dispenser box allows for dust resistant storage. PHOTEX® Scanner and Screen Wipes are soft, absorbent and lint-free. PHOTEX Wipes contain no chemical or polymer binders so they will not scratch sensitive surface. (Unlike paper wipes, Photex won't scratch even after repeated use. Photex Scanner and Screen Wipes are ideal for use wherever dust control and static neutralization is critical. 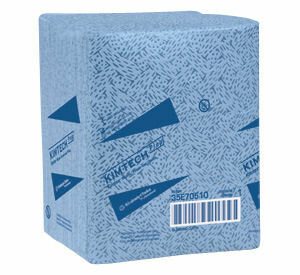 These wipes are Specifically designed to reduce or eliminate static build-up, each wipe is treated with a highly effective, dry antistatic agent that guarantees no oily residue on surface or hands. Excellent for cleaning: Scanner Drums; Computer Screens; Glass and Optics; Photographic Film; Light Tables. New! Photex VIP Digital Anti-Static Wipes are soft, streak free, anti-static, lintless, and strong. These wipes are excellent for digital printers, computer screens, glass and optics and CDs. These come in convenient easy to use pack that are great to keep on your desk, near your computer and printer. WYPALL Microfiber Cloths with MicroBan protection - Clean virtually any surface with these environmentally friendly, microfiber clothes. WYPALL microfiber cloths allow you to reduce annual cleaning costs without reducing the quality. Environmentally friendly design requires no chemicals. Lifts and traps dirt and can be used dry, wet or damp. Durable design capable of absorbing up to eight times its weight in liquid and can be laundered 300 times. Size: 15.75"L x 15.75"W, 24 wipes per case. VERATEC® Cheesecloth provides the proper absorbency for applying gum. Other materials often absorb too much. Gum Arabic is an acidic water soluble gum obtained from an acadia tree. It adheres to the metal surface or plate and protects the non-image areas from oxidation, scratches, grease and dirt. When going right to press, plates should be gummed to insure the best possible performance. VERATEC Cheescloth is the ideal surface for applying a uniform, thin film of gum to an offset plate. It is soft, absorbent and can't scratch or scuff the image area. 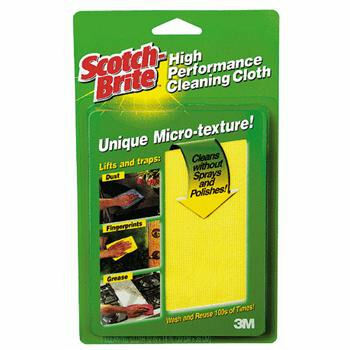 Scotch-Brite Micro-fiber (High Performance) Cleaning Cloth - this soft micro-texture cloth is scientifically engineered to gently lift and trap dust and lint from any surface. Great for frames, glass, and memorabilia. Fingerprint oils and smudges also wipe away from glass without streaking and without chemicals or sprays that you do not want on your cherished items. Safe and effective on virtually any surface. Smudge-free, lint free and scratch-free cleaning. No chemicals cleaning sprays or polishes needed. Machine washable and dryer safe.